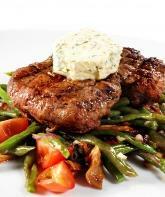 Bistec A La Parilla (Sofrito Marinated Steak) - Tienditadepuertorico.com - Buy Puertorican Food Here!! Rub adobo evenly into steak. Allow meat to marinate for at least 30 minutes or 2-3 hours but overnight is best. Grill or broil meat to desired doneness, about 8 minutes per side for medium rare. Let stand 5 minutes then slice.